Before the first snowflake falls to the ground, you will want to consider winterizing your watering systems. If you are thinking about making any big changes, they should be made before the ground is frozen, especially if you are planning to install a permanent watering system. 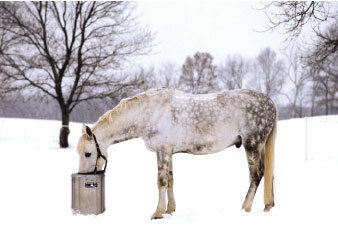 When water freezes over or gets too cold, it limits the amount of water a horse will drink. Horses should drink about 37 to 45 litres of water per day in order to stay healthy, and tend to drink less water when it is icy cold, particularly if there are any dental issues. That&apos;s why access to water and the temperature of the water are equally important factors to consider. A dehydrated horse can run the risk of developing colic and other health issues. There are a number of types of colic but the one most common in winter is impaction colic. In general, horses will often reduce their water intake as temperatures fall. The combination of reduced water intake, with increased forage consumption during the cooler months makes them more susceptible to health issues. Relying on a horse to eat only snow as the source of water does not provide them with the daily intake that they need in order to survive. Remember, water is the most important nutrient that your horse requires daily, all year round. There are a number of different options available to help you manage water supplies for your horses over the winter months. Depending on your facility setup there are outdoor and indoor water solutions, including de-icers, drinking posts, automatic waters, and heated buckets as examples. If you are looking for a long-term solution, installing heated automatic waters is a safe bet. They are more money up front, but it pays off in the long term with labour efficiency and overall reliability that provides peace of mind for the horse owner. They come in different sizes and have heating elements that keep the water in the bowl from freezing. The nice aspect about going with an automatic waterer with a built-in water heater is that you don&apos;t have to manually fill the tanks each day. Though, it is still important to check the watering system daily to ensure that they are working properly. A popular option is installing a frost-free yard hydrant. They operate all year round, including the winter. One of the main features of a hydrant is a stop-and-drain valve. When the valve is open, water comes from the line. And when the valve is closed, the flow of the water stops. The water left in the pipe flows out of the drain hole and into the gravel bed. 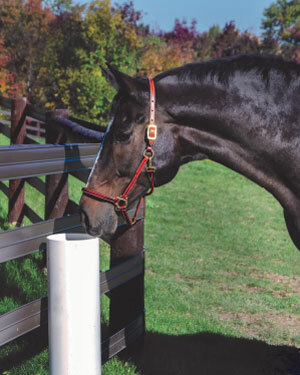 The catch with this option is that you will still need to manually get the water for your horse at least twice a day by hand from the hydrant. If you are using the hydrant to fill a stock tank you will need to use a tank de-icer to keep the water from freezing once it is in the tank. You can also use a heated hose to get the water from the hydrant to the trough. If you don&apos;t have access to electricity, it will be harder to keep the water from freezing, but it can be done. One of the best options out there is a drinking post. Case in point, it is low maintenance, electricity-free, and is an all season waterer that operates much like a frost-free hydrant. The drinking post is installed below the frost line. As the horse presses on the paddle, the bowl fills up with water. Once drinking is complete, the water drains so it does not freeze. 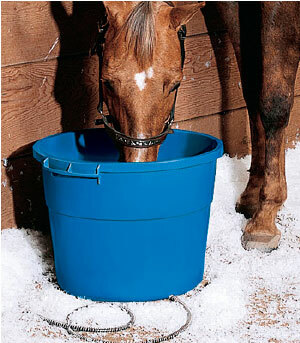 If your horse is accustomed to a bucket in its stall, you can go with a heated bucket. They come in different sizes, but often the larger the better (16 gallon). As a safety feature, they come with grounded cords, located at the back of the buckets. This is important if your horse decides to chew the bucket. Heated buckets are to be used in an indoor sheltered facility. Your horse&apos;s hydration and health rely on consistent access and consumption of water and maintaining a comfortable drinking temperature encouraging them to drink. To avoid hauling water by hand in the snow, winterize your facility in advance which will save you some barn chore hassles during the winter months. If you already have winter water options, consider upgrading them or at least conduct an annual inspection to make sure your watering systems are in good working order. This includes checking for leaks, major rust spots, and making sure all elements are working correctly. Once your systems are installed and in use, be sure to check them on a daily basis to make sure the water supply is free flowing.